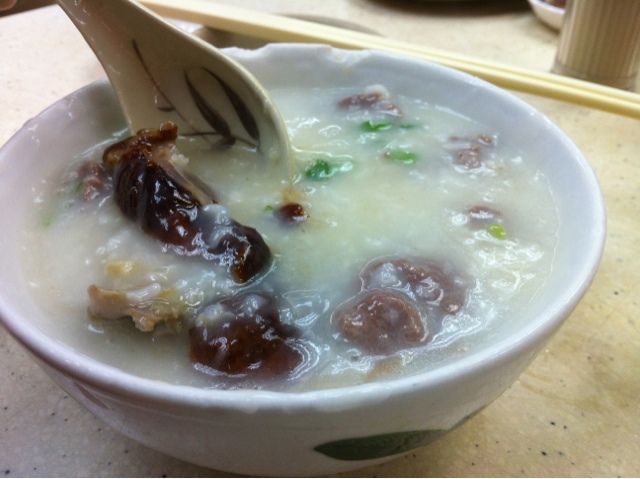 Congee and noodles - pretty regular Hong Kong stuff, eaten any time of day: breakfast, lunch or dinner. When I was in high school, Mong Kok was only about 15 minutes walk away, and was where I'd catch the MTR to go home, so I knew it intimately, but that was embarrassingly long ago. These days, I don't get out to Mong Kok enough to know what's good, and meeting up with an old friend who needed to be in the area was just the excuse I needed to do a little digging, and voila, I found Fu Kee, next to a cha chaan teng I used to go to all the time (cheap egg tarts = excellent afternoon tea for a kid with a HK$20/week allowance). Fu Kee has been around for ages; I don't know why I'd never been. If a full house for early Monday lunch is anything to go by, it's still as popular as ever.